We develop a new algorithm for population synthesis that fuses remote-sensing data with partial and sparse demographic surveys. 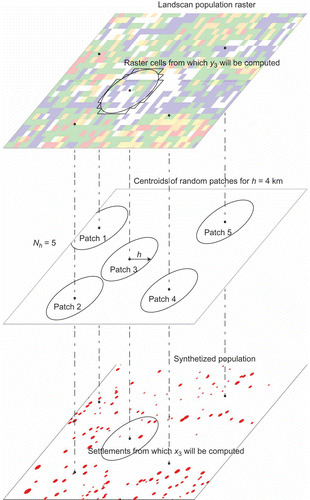 The algorithm addresses non-binding constraints and complex sampling designs by translating population synthesis into a computationally efficient procedure for constrained network growth. 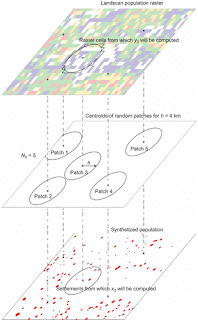 As a case, we synthesize the rural population of Afghanistan, validate the algorithm with in-sample and out-of-sample tests, examine the variability of algorithm outputs over k-nearest neighbor manifolds, and show the responsiveness of our algorithm to additional data as a constraint on marginal population counts. Rizi, S.M.M., Łatek, M.M. and Geller, A. (2012), ‘Fusing Remote Sensing with Sparse Demographic Data for Synthetic Population Generation: An Algorithm and Application to Rural Afghanistan’, International Journal of Geographical Information Science, DOI:10.1080/13658816.2012.734825.